Oculus has announced that its new system software for the Rift, previously known as Rift Core 2.0, is officially out of beta and is now rolling out to all Rift owners across the entire platform. The latest version of the Rift software includes a number of major performance improvements, UI updates, new social features, and a wide variety of customization options to enhance your Oculus Home decor. Oculus says that the vast performance improvements implemented in the software also ensure that both Oculus Home and the Oculus Dash interface can run smoothly on both recommended and minimum spec computers. With dynamic lighting and physically-based renderers, Home looks better than ever. 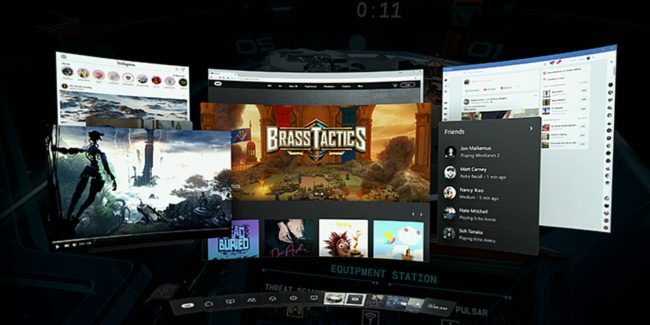 Bring the power of your PC into VR with Dash’s virtual desktop, which lets you easily access and interact with your desktop windows and apps. Carve out a corner of the metaverse and customize your Oculus Home with hundreds of themed items and environments—and import your own 3D models and objects for a more personalized touch. Get the party started and host up to eight friends simultaneously for social hangouts and co-watching. In addition, custom developer items are also introduced in Oculus’ latest Rift software update, which lets developers add unlockable objects for Oculus Home in their game—such as animated objects, sculptures, trophies, and avatar clothing. Now, users can showcase unique achievements they have managed to unlock from their favorite games and apps. So far, a total of 32 unlockable objects are available across nine different titles, including Moss, SUPERHOT VR, Echo Arena, Lone Echo II Trailer Experience, Brass Tactics, Job Simulator, OrbusVR, Arizona Sunshine, and Loco Dojo with many more to come. Check it out, and experience the new system software today!